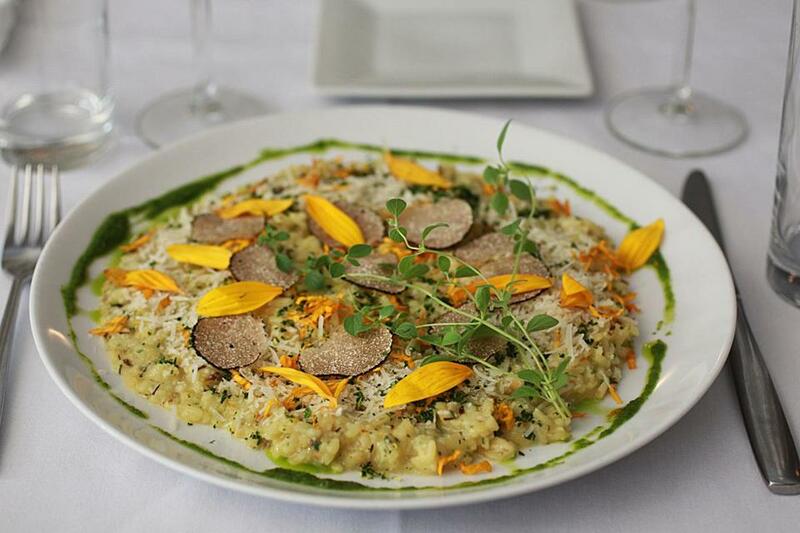 Sunflower risotto, from chef Charles Draghi at Erbaluce. Most people know sunflowers for their aesthetic beauty or the seeds beloved by baseball players, but area chefs are starting to see them as much more than just decoration. 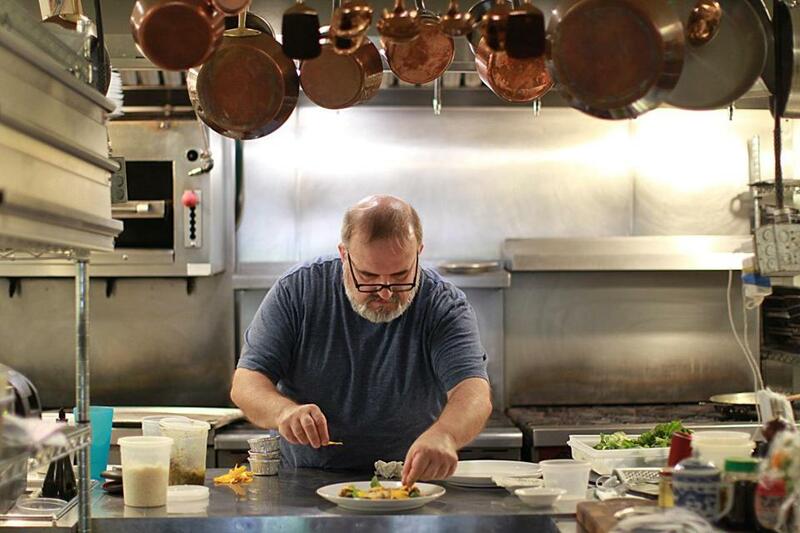 Charles Draghi, chef-owner of Erbaluce in Boston, is known as the culinary “king of sunflowers,” as Bar Mezzana chef Colin Lynch puts it. Diners at his Bay Village restaurant can enjoy an entire meal based around the artichoke-like ingredient — starting with homemade gin in their Pierrot cocktail, then moving on to a braised sunflower appetizer, sunflower risotto, and the sweet finale: sunflower gelato. Draghi estimates that nearly every table at his restaurant orders something with a sunflower twist. He says that right when the season starts in June, he has customers calling and texting him, asking if the sunflowers are in. “They’ve been on Erbaluce’s menu for a while. I think Chuck deserves a lot of credit for featuring them,” says chef Michael Scelfo, who grills sunflower bulbs at Alden & Harlow and serves them with smoked lamb, pickled lemon, and pepper relish. Others are finding uses for sunflowers, too. Shepard chef de cuisine Peter McKenzie serves heirloom tomatoes with sunflower barigoule, sprouts, and hyssop. At Ceia in Newburyport, executive chef Jeremy Glover enriches both heirloom tomatoes and zucchini with versions of sunflower crema, and for dessert, brown butter cake is matched with sunflower creme anglaise. Lynch, currently using sunflower oil in raw fish dishes, plans to incorporate more parts of the plant at Bar Mezzana as soon as the flowers are bigger. Brandon Baltzley, the chef behind pop-up restaurant the Buffalo Jump in Falmouth, has been working with the ingredient for the past three years. Baltzley says he “turns” them like artichokes, peeling away the outer leaves and trimming off the bitter green parts until he’s left with just the heads. He then soaks them in buttermilk, coats them in flour and a little cornmeal, and deep-fries them. The texture, Baltzley says, is akin to sweetbreads, which “blew [his] mind.” Baltzley said his guests were “confused but in a good way,” and he plans to keep them on the menu for the next few weeks. 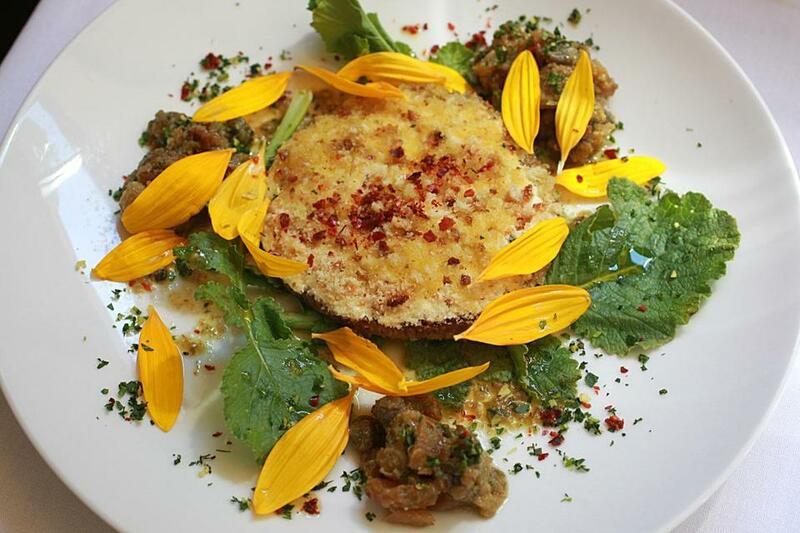 Braised sunflower, an appetizer by Erbaluce chef-owner Charles Draghi. While it doesn’t seem instinctive to look at sunflowers and see dinner, chefs say they’ve been an ingredient in Native American, Italian, and French cuisines for years. Renowned French chef Edouard Loubet’s work with sunflowers inspired many of the Boston-area cooks to start experimenting with the plant, which Baltzley says has a creamy, nutty, distinctly floral and sweet flavor profile. If they’re not cleaned and prepared properly, however, Baltzley says they can be quite bitter and off-putting. While those iconic heads can be tricky and time-consuming to prepare, the less-recognizable parts of sunflowers have played a steady role in American cuisine, under names like Jerusalem artichoke and sunchoke. Cold-pressed sunflower oil has also been a staple in restaurants nationwide as a rise in allergies limits peanut, corn, and soy oils in the kitchen. And, as any economics 101 class will tell you, with demand comes supply. Chris Kurth, owner of Siena Farms in Sudbury, supplies Draghi and most of the Massachusetts chefs with their sunflowers. He says the plants have been the farm’s most profitable and reliable crop across the board. “They stop people in their tracks” Kurth says. “They’ve kind of become our unofficial logo.” At Siena, he and his team grow 5 acres of single-stem, organic sunflowers annually and harvest anywhere from 10 to 30 large buckets of sunflowers every day. Draghi said he buys at least one 5-gallon bucket whenever he goes to the market and stresses the importance of buying organic flowers that haven’t been exposed to systemic pesticides. Kurth says culinary use of sunflowers is still fairly niche, but if the trend holds strong for a few more seasons, he’d be interested in looking into growing varieties specifically for consumption. Until then, he’ll keep selling his current strain at retail locations in Copley and the South End. Carly Sitrin can be reached at carly.sitrin@globe.com. Follow her on Twitter @carlysitrin.